In less than 2 years from now, Malaysia expect to generate 5.5% of its total energy capacity from renewable source. Going by what's hot on the list of Sustainable Energy Development Authority, these sources would most definitely be Biogas, Biomass, Hydro-power and Solar PV. 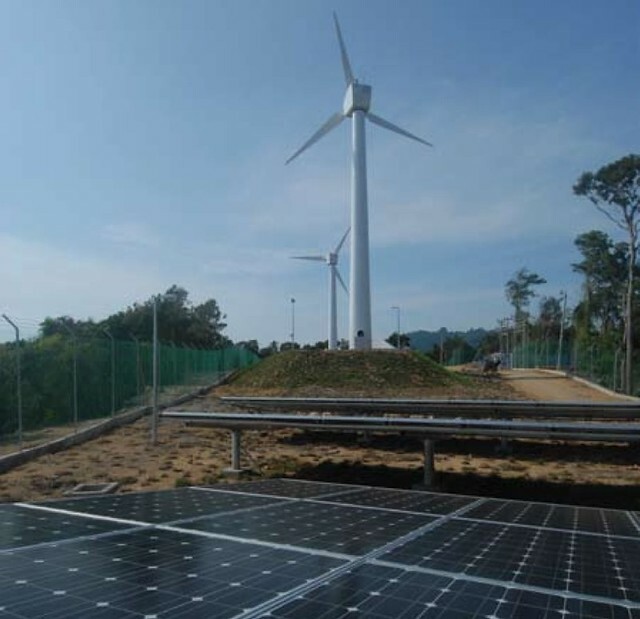 Wind turbines and solar PV in Pulau Perhentian Kecil, Terengganu. Photo by TNB via Pemandu. The Prime Minister said the government had created support mechanisms, including the Feed-in-Tariff, which pays a premium rate for green electricity to achieve the goal. "We have pushed renewable energy into the spotlight and now aim to secure 5.5 per cent of the total energy capacity from renewable sources by 2015 and 11 per cent by 2020," he said in his keynote address at the official opening of the third International Greentech and Eco Products Exhibition and Conference Malaysia (IGEM 2012) here on Thursday. He said it is estimated that renewable energy will generate RM70 billion worth of economic activity by 2020 and support 50,000 jobs. "It will also avoid 42.2 million tonnes of carbon emissions, about a 40 per cent reduction, which I promised at the Copenhagen Climate Conference," he added. Alongside generating more clean electricity, Najib said Malaysia must also strive to conserve it, as energy efficiency can save Malaysia RM14 billion in Gross National Income (GNI) by 2020. "So, we are developing Energy Services Companies to help users find savings, encouraging energy efficient appliances for homes and businesses, and supporting efficiency drives with tax incentives," he added. He said Malaysia had good potential to become a regional hub for electric vehicles, with a vibrant, world-class industry. "That is why we reviewed the National Automotive Policy, to stimulate investments in electric vehicles, with research grants and tax incentives," he highlighted. He said Malaysia's green industries are already worth some RM67 billion and grew by six per cent between 2010 to 2011, outstripping the global green sector. "One of my ambitions is to encourage green industries to expand and innovate, and not just for the environment, but because it is so plainly good for our economy," he added. Najib said it is estimated that all the green projects under the Economic Transformation Programme (ETP) will generate a total GNI of RM53 billion by 2020. TheGreenMechanics' two cents: We are still waiting for the launch of more affordable Electric Vehicles (EV) in Malaysia. Much has been talked about full EV and let's hope that sky-high motor vehicle prices exclude environment friendly models like EV. Secondly, the FIT should cover other states like Sarawak and Sabah and not just those in Peninsula Malaysia. It is still unclear if the suspension on FIT scheme in Sabah has been lifted.